A bad hairline can be difficult to deal with. And the sad reality is that more than two thirds of men will experience some hair loss by the age of 35. This means most guys will have to find a way to fix or grow their receding hairline back if they want to continue styling cool men’s hairstyles. 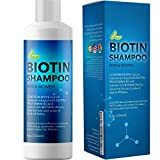 But men experiencing crooked, terrible hairlines are sure to try anything to reverse the damage and grow their hair back, oftentimes experimenting with expensive “miracle” hair growth products that don’t make a difference. While a messed up hairline may be a result of your genetics, there are many other factors that can cause an uneven or receding hairline, including stress, bad nutrition, and horrible hair care. Below, we discuss 5 ways to fix a bad hairline. From simple solutions like changing your haircut or styling product to potentially getting a better hairline through lifestyle improvements, these are easy and quick changes you can make before considering more drastic steps, such as a hair transplant. Like growing a beard, a big factor in the quality of your hair is your nutrition. While the right diet can’t bring back your hairline, it can contribute to stronger hair and slower hair loss. Eating protein-rich foods such as chicken, fish, eggs and nuts as well as most vegetables can make your hair healthier, shinier and thicker. To make sure you get all the right vitamins and minerals for healthy hair, skin and nails, we recommend a multivitamin. We do not endorse vitamin products or brands that promise to grow your hair faster – 99.9% of the time, those products cost much more than a generic multivitamin and have the same ingredients. While many experts will tell you that all stress contributes to hair loss, this isn’t entirely the case. Physiological stress, which can be brought on by medical or lifestyle changes, can lead to hair loss. Emotional stress brought on by day-to-day hardships in life does not usually contribute to a bad hairline. However, once these stressors are addressed, your hair can grow back and the normal growth cycle may continue. Some “experts” will claim that washing your hair too often can contribute to terrible hairlines. This is only the case if you’re using a shampoo and conditioner that is chemically-abrasive and damaging your hair, which isn’t the case for almost all major brands. In fact, real experts advise shampooing thinning hair 3 to 4 times a week since clean hair appears naturally thicker. Men experiencing a receding hairline have a hard time accepting this when they see their hair falling out. Unfortunately, this shedding likely occurs regardless. In fact, the issue may have more to do with how roughly you wash or treat your hair. Here are some of the best hair loss shampoos for men to help fix your receding hairline and make your existing hair look and feel thicker. If your hair is thinning or you’re developing bald spots near your hairline, it makes more sense to cut your hair shorter than to let it grow out. Most guys are surprised to learn this, but short haircuts minimize the contrast that brings attention to your baldness. But there are plenty of good hairstyles for men with a widow’s peak or receding hairline. If shaving your head isn’t an option, then you may want to consider a buzz cut, a high skin fade, or an undercut hairstyle. With these very short cuts and styles, people won’t notice your thin hair or bad hairline as much. Just remember to use a quality styling pomade or hair wax for a textured natural look instead of a gel. Textured hairstyles do a better job of covering your scalp and providing a “thicker” appearance to your hair. If you feel your bad hairline or thin hair is only getting worse, then it may be time to take more aggressive action. 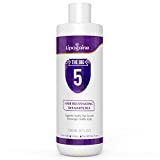 To prevent or even reverse hair loss, you may want to consider a hair growth product that can stimulate your follicles. While there are many hair treatments available, the best is men’s Rogaine. 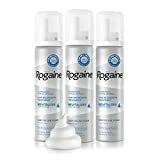 As the top brand recommended by dermatologists, Rogaine’s easy-to-use foam is the most effective hair regrowth product on the market. The active ingredient is Minoxidil, an FDA-approved medication for male hair loss. To explain the process, this topical medication works by increasing the growth phase of hair and revitalizing dead hair follicles to regrow new hair. In clinical testing, Rogaine produced results in nearly 9 out of 10 men. 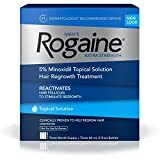 If you want to prevent hair loss once and for all, Rogaine is the way to go. We also recommend Kirkland’s Minoxidil 5% Extra Strength formula for a generic product that’s cheaper. Kirkland is Costco’s private label brand, so expect solid results at an affordable price. If you have run out of ways to fix your hairline or regrow your hair, then consider speaking with your doctor or a specialist to see if any new treatments options are available and right for you.